It must be extraordinarily difficult to learn Spanish if you think you don’t like learning languages, or if you hate grammar, or don’t know what the English words are for different parts of speech. I’m very fortunate to find that I genuinely enjoy the grammatical building blocks of a language, and I love practising and improving my Spanish. I went to my first Spanish lesson about a few years ago. Dorset Adult Education, evening classes at the school just behind my house, taught by a Dutch woman. After the first, beginners’ year, they didn’t run an improvers’ course, so my friend Hazel and I carried on meeting on the same night, at each other’s houses, and used the superb Michel Thomas CDs to work on grammar. With high motivation, and Michel Thomas’ help, we sped along. In year three we felt we needed external guidance again, so drove 30 miles each way to Poole Adult Ed each week to do a GSCE class with the irascible Carlos, a Columbian man with a penchant for teaching slightly risqué vocabulary (though to be fair, he did get the WHOLE class though the exam). Year four and no classes to be found, so Hazel and I had a holiday in Sevilla and carried on with Michel Thomas’ Advanced Course. Year five and still motivated, we searched for an advanced conversation class and found we had to drive 26 miles to Salisbury College each week where a very strange teacher (this time Bolivian) imposed her views on art or literature, preferring to get HER point across about an artist, rather than encouraging the flow of discussion amongst the students. That summer I treated myself to a week-long intensive course in Madrid, coupled with a home-stay in a Spanish family’s house. It was an exhausting week but incredibly valuable (and not overly-expensive), and I felt my language was more fluid at the end of it. Here in Colmenar, as in most towns, the Ayuntamiento puts on free classes. But last year the funding came primarily from the health department, so we had to focus on health-related vocabulary, resulting in repetitive slide-shows of clinic reception areas and hospital departments. Also, the group-leader was not a teacher of Spanish-as-a-foreign-language and was unable to help with complex grammatical questions. A useful service for us immigrants, but it is inevitably difficult for any teacher to deal with a wide range of skill levels and sporadic attendance. We’re very fortunate also to have Axalingua in the village. 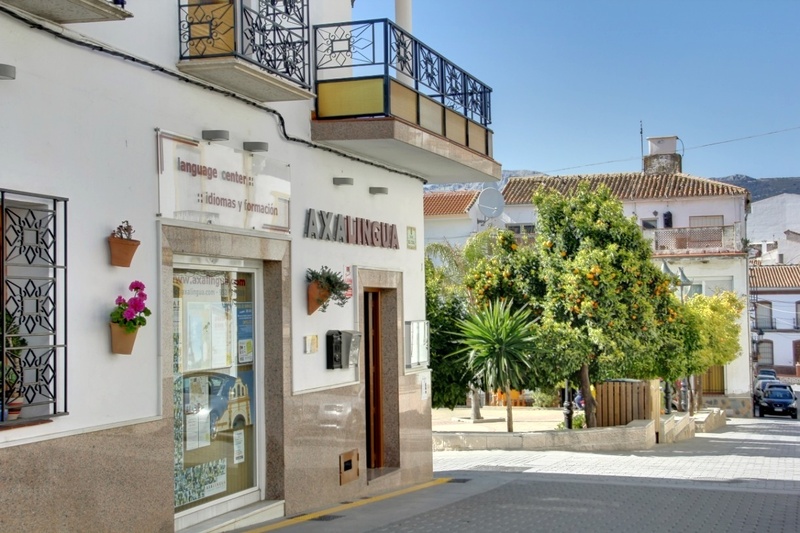 A professional language school run by los hermanos guapos Pepe and Juan-Mi, they offer English and French to Spanish people and Spanish to all the immigrants and tourists. A friend came to stay with me and attended a week-long intensive beginners’ course, and rated it very highly. I have attended the fortnightly advanced conversation group and really enjoyed the fun yet rigorous teaching style, and want to attend more regularly. More recently I have begun a one-to-one inter-cambio with José down in Torre del Mar. So far this is proving to be the best method for language improvement so far. We share the time, half on improving his English and half on improving my Spanish. Through conversation, we establish where each other’s weak points are, and then at the next lesson we each bring a prepared exercise designed to strengthen the vocabulary, grammar, or pronunciation issues identified. José has excellent vocabulary but wants to improve his pronunciation. I am a level or two below him in my Spanish, and he drills me on tenses, as well as helping me use a more natural and colloquial word-order. I’m very lucky to have found an inter-cambio who is as serious as I am, and as interested in getting the grammar right. Other Spanish friends are fantastically useful at correcting me and expanding my vocabulary but of course don’t focus on whether we should be using the conditional or the pluperfect subjunctive at any given moment! On top of that, I try to visit a bar several mornings a week (I know, it’s a tough life!) 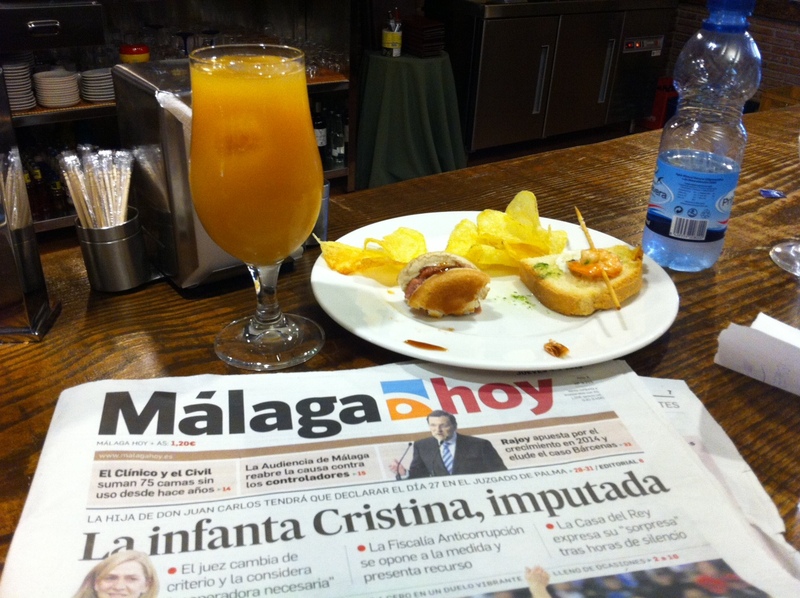 to drink a coffee or juice and read Málaga Hoy, looking at the more formal constructions they use (ridiculously pompous might be another description!) and how it contrasts with chatting with José and others. I have Spanish telly in the lounge and try to watch the news a few times a week, and occasionally something like the Spanish “Quién Quiere Ser Millonario?” can be quite fun. My bedside clock-radio chats rapidly and incomprehensibly to me in Spanish as I fall asleep. Out of all possible methods, I think my top recommendation for other British people in Spain would be to find a really good inter-cambio language partner (but no, I’m not sharing José!). Or a few private lessons at Axalingua to get you to the level where you can confidently join a class or conversation group. Plus I believe that the Michel Thomas CDs (the Foundation course and then the Advanced course) are unbeatable, whatever level you are. I still keep Advanced CD 4 in the car and just play it over and over, listening to the verb constructions and those awkward “should have”, “could have”, “would have”, “might have” etc etc. Oh there’s an idea! José wants to practice contractions. I foresee a session on “could’ve” and “might’ve” coming on …..
Deberíamos haber practicado más, así habríamos podido entenderlo. We should’ve practised more, that way we’d’ve been able to understand it. Si hubiera hecho los deberes, habría sabido como traducirlo. If I’d done my homework, I would’ve known how to translate it. 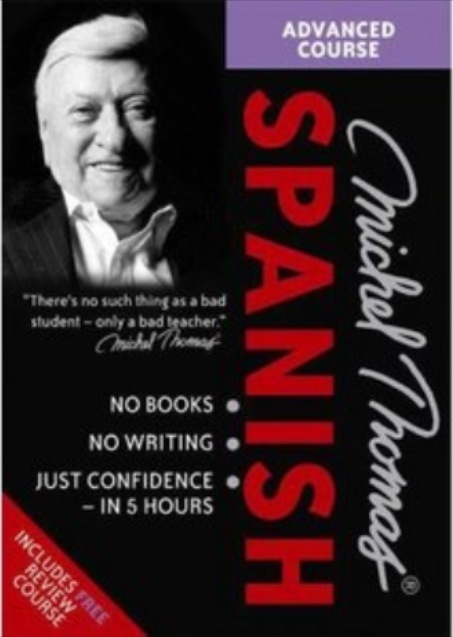 This entry was posted in Spain and tagged Andalucia, Axarquía, Colmenar, Inter-cambio, learning Spanish, Michel Thomas, Spain, SpanishBlog, Tamara Essex by tamaraessex. Bookmark the permalink. Great article, Tamara. Speaking from personal experience, I can highly recommend the Language Exchange Group on Gran Canaria. If anybody is relocating here, they have a FB page: https://en-gb.facebook.com/LEGIntercambio. Lovely post, Tamara. I enjoy reading about how other people are improving their language skills. Love tour blog, Tamara. One addition: classes in German are also available at Axalingua Language School. Ah, Tamara – you are my dream student! It is such a delight to hear how much you are enjoying learning Spanish. No wonder you are enjoying your new life in Spain so much. I would teach you for free if I were there, just for the pleasure of working with such a motivated student! In saying that, it looks to me as though you have a really solid grasp of the grammar already – well done! A good intercambio is gold dust. We’re at the stage where, although we have many weaknesses, we feel we get more out of conversational practice than we do out of excercises. it has turned out to be a longer haul than I expected but I think that if we keep at it we’ll get there. Yes but how is your Andalusian Tamara? A friend tried learning Spanish and went to the Alpujarra and discovered she couldnt understand very much at all as they all spoke thick Andalus!